Many of our land management practices have damaged soil health. We need better ways of doing things. The checklist aims to encourage curiosity, observation and testing. It will help construct a Soil health management plan, a key part of any property management plan. Click on any of the links below. 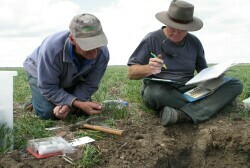 A Agriculture Victoria soil scientist engages with a farmer near a soil pit site.